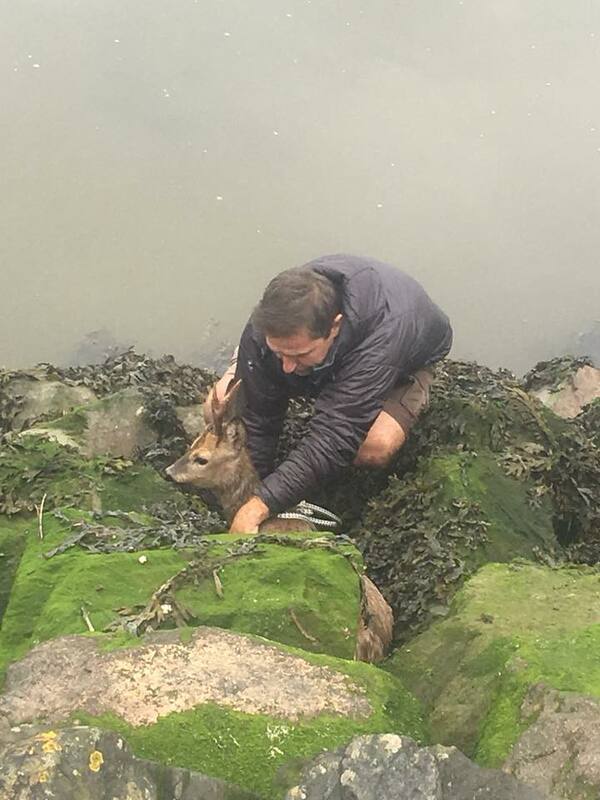 Golden Globe Race entrant Kevin Farebrother with the rescued deer. 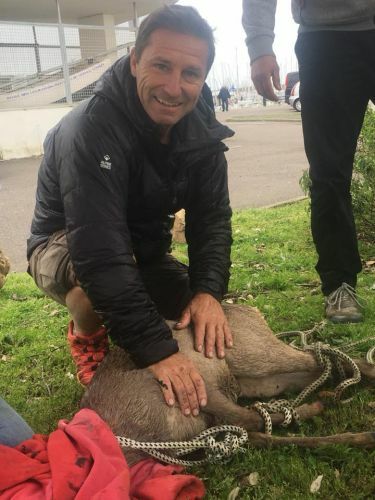 KINROSS resident and Golden Globe Race entrant Kevin Farebrother has made headlines in France after saving an injured deer that was stranded in a marina. Mr Farebrother, who is due to leave Plymoth in England to sale solo and non-stop around the globe in June, was in France preparing for the trip when he spotted the animal. 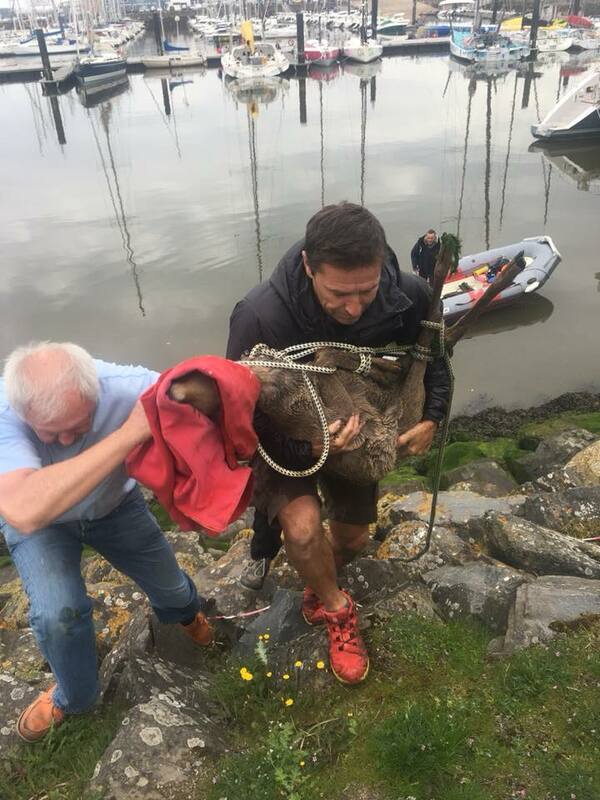 He said he was working on his boat when he saw the animal stuck in rocks in the marina. “I was hoping it would swim towards the ramp on the other side but it was tired and needed to get out, unfortunately here there are huge tides and the rocks are full of seaweed and very slippery,” he said. “His legs got stuck between the rocks and he couldn’t move. The tide was changing so I went to grab him. His legs were cut and bleeding but nothing too serious. The 50-year-old has climbed Mt Everest three times and will now attempt the 48,280km Golden Globe Race, without modern equipment such as electronics or satellite-based navigational aids. He said preparing for the Golden Globe had been a huge task. “My boat preparation is going well, it’s been a huge logistical task but I’m now feeling that I will make the start barring any big disaster,” he said. Mr Farebrother said he believed the race would be harder than climbing Mt Everest. He said he didn’t grow up sailing or climbing, but had a thirst for adventure and wanted to prove ordinary people could do extraordinary things. “The race is stirring up a whole range of emotions for me. I wake up different everyday – anxious, excited, scared, but on the whole I’m looking forward to the challenge,” he said. “I’m not doing it for the love of sailing but for my passion for adventure and pushing myself to the limit.